@Boots Take a look at this thread for ideas. the majority probably are. I couldnt remember without rereading it myself. I was just suggesting it if you hadn’t read it yet. You will get more replies to this thread regarding your question too. In the other thread there are a couple hard cases that were really nice and there is a pic of a hard case I made out of a cordless drill box. I know thats not what you were exactly thinking of though. 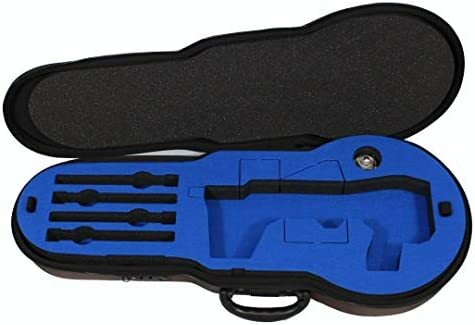 If you’re looking for a hard case, this is a good choice with plenty of space and affordable compared to others but if money is not an issue, get the pelican which comes in many many different sizes and shapes. That’s why I was looking at case club. In some instances https://www.caseclub.com/product-category/case-club-cases/gun-cases/ offers the same dimension cases as pelican but at a cheaper price. I see decent deals for pelican though, but ill check harbor freight as well! I don’t think I ever saw a pelican for under 150 used at 17+ inch width, even their laptop cases are like 250-300, $55 for a 18" from harbor freight is a great deal and usually they have a 25% off coupon making it around $40. Obviously being from their direct store, you can find it cheaper elsewhere. But yea you can beat $40. Hoot … I have two. One is tagged to haul the Papoose. The second was just 'cause. I was thinking trumpet or sax case. What would be cool is an autoharp case, I think it would just fit, due to its shape. I bought the hard case from Harbor Freight with a coupon for $45 and removed the bottom layer of solid (cheap) foam to make room for a new top layer. I then ordered a 2’ by 4’ by 7/8" thick section of Fastcap Kaizen foam from Amazon for $16 including shipping. I then cut a section to fit as a top layer using the space made available by removing the bottom layer of foam and made custom cuts for the various items. Where things extended deeper than the Kaizen layer, I took advantage of the pick and pluck foam below that came with the case. There was plenty of room for the Sub 2K, multiple mags, the red dot, and also my hand gun and its magazines. See the photo below. And I had foam left over for a couple of pistol cases, etc. ADDENDUM: The Harbor Freight Case is in my opinion a great deal at $45 or even full retail of $55. It is IP65 rated with thick walls of reinforced polypropylene and four strong latches. I think you could drive your car over it without damaging the contents. If anything, it is a bit too heavy for the job. The only negative I see is that the pick and pull foam is cut in deep sections that are not ideal for gun use. @JoeFridaySays Now that looks like a pro job. Thanks. It really wasn’t that hard. I just outlined the shapes with a silver highlighter (from the back in reverse). Then I used a cheap disposable razor cutter with snap off blades to cut them out being careful to keep the cuts vertical. When the cutter stopped sliding like butter, I threw it away and used a fresh one - I think it took two to do the case. Then I flipped it over and made a few clean up cuts and it was finished. The key is to be patient and not rush the cutting. I happen to be cheap and did not want to waste my investment or do it over. If you are going to use the case for storage as well as transport, consider replacing the remainder of the open cell foam with Kaizen. The open cell stuff will tatoo the foam pattern onto metal bits over time. If it is strictly transport … no big dealio. I am only using it for transport but that is still useful information to know. Thanks Dred. I had no idea the regular foam would do that and would never have considered replacing it given the comparatively high cost of Kaizen foam. The combined knowledge on this forum, whether from training, experience or (in my case) repeated screwups, is amazing.